Cornflake was handed in to our vets just before Easter. He is very cute looking, but do not be fooled by this. He can be a very difficult rabbit. He is young (probably still growing) and full of energy. Unfortunately this energy can make him a little unpredictable. He was neutered at the end of April 2011 and it has taken over a month for him to begin to calm down. He will tolerate being carried and groomed, but he still wants to protect everything in his hitch/run so we have to be careful about leaving unprotected fingers near him !! 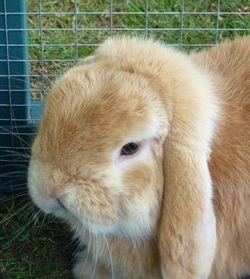 At present he is not suitable for families with young children, or those wanting a "cuddly bunny". However, we are hopeful that as his hormones settle he will become less boisterous and be easier to handle.